While Camera Canada provides Canadians with excellent prices on photographic equipment, people outside Canada may want to take advantage of these low prices too! For customers outside Canada, you simply select "Other" in the country field on the Checkout form after selecting the products you want to purchase. Type in the required information and we will get back to you with exact shipping costs. For U.S. orders, payment is via PayPal only. Brockerage fees, duties and courier surcharges may apply to your order which are NOT covered by Camera Canada. Typically, these costs are taken by the courier ($24US for US orders shipped UPS for example). Please be aware of these potential costs! Unfortunately we cannot accept international credit cards. To purchase products from Camera Canada internationally, use international wire-transfer procedures via your local financial institution. E-mail info@cameracanada.com to get the wire transfer details. 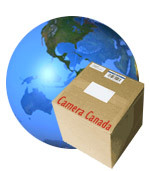 Brokerage fees, duties and courier surcharges may apply to your order which are NOT covered by Camera Canada. We reserve the right to refuse shipments to international destinations.